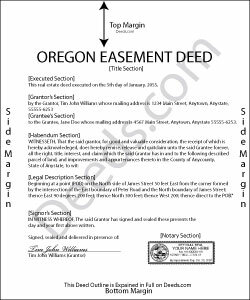 An easement is defined by Oregon statute as a non-possessory interest in the land of another person that entitles the holders of an interest in the easement to a private right of way, embodying the right to pass across another's land (105.170). The holders of an interest in any easement are required to maintain the easement in repair (105.175). Certain types of easements, such as solar energy easements and wind energy easements have specific recording guidelines, which are given in sections 105.895 and 105.910 of the Oregon Revised Statutes. An instrument creating an easement that is executed by the person from whom the interest is intended to pass, and acknowledged or proved in the manner provided for the acknowledgment of conveyances, may be indexed and recorded in the records of deeds of real property in the county where the property is located (93.710). An easement deed can be acknowledged before any judge of the Supreme Court, circuit judge, county judge, justice of the peace, or notary public within the state of Oregon. A seal of the grantor, corporate or otherwise, is not required (93.410). A county clerk may refuse to record an easement deed if it does not contain the original signature of the person executing the instrument and the original signature of the officer before whom acknowledgments were made (93.804). An easement deed should be recorded in the real property records in the county where the property subject to the easement is located. If the easement is not recorded, this will not affect the enforceability of the agreement among the parties thereto and any other person with actual notice of the agreement (105.175).